Three and a half years ago, I took an oath in a box similar to this, an oath to be as fair and impartial as I possibly could. I came back to this box every day for three more (full) days and reached a verdict with 11 other people on the fate of an alleged domestic abuser. Living in Los Angeles, going to jury duty (or running marathons!) is pretty interesting. 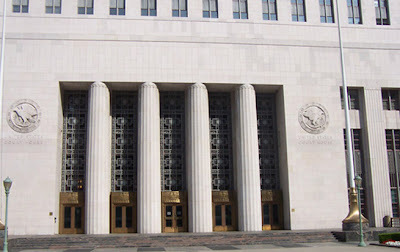 The court houses are located in Downtown LA, near Union Station and Olvera Streets, Little Tokyo, and Chinatown. When in Downtown, you see just about as much diversity as one could see in one area -- ethnically, age-wise, and socioeconomically. I like being able to walk around Downtown so much that I didn't mind my last jury service. But that's when I was paid (by my company) to go. Nowadays, I don't get paid for any time that I am away from work (except holidays, thank goodness!). So I'm a lot like a freelance worker with no benefits, which includes this jury service. Knowing this, I spoke before a judge to try to get excused from a potentially long trial that would cut my monthly earning by 25%. Ouch, when you don't make much and need to pay for your own health insurance and just paid for your student loans, dog's neutering and cat's teeth cleaning. Anyway, the judge was not very sympathetic, so I decided to stick around. Immediately, I was pulled into a court room and spent the rest of the day (!) 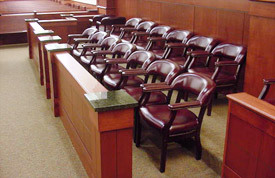 involved in voir dire, the jury selection process. Thankfully, just 15 minutes before the day ended, I guess the defense attorneys didn't like something I said and gave me the boot. Another few minutes and I would have been on this trial. No offense taken to this booting. Honestly, I don't think I would have been able to be a fair/impartial juror given that the case involved white supremicst groups (this was a Federal court). Picture taken around the time I last served (2008). Ten points if you can guess where this was taken! ﻿I have always been fascinated by the justice system and government. 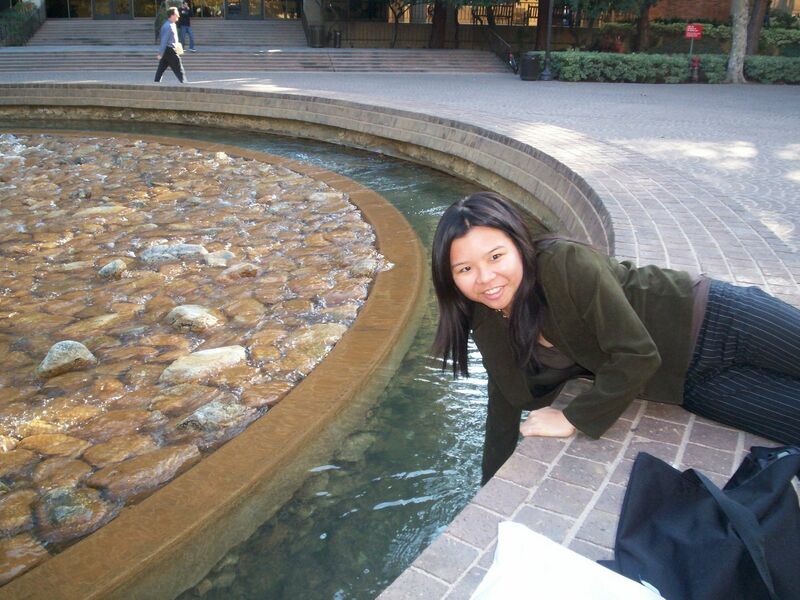 I minored in Public Affairs in college and got a taste of public policy, social welfare, and urban planning. Therefore, I got to look at Pareto plots, sit in on drug rehab meetings, and learn about urban sprawl. Had I not been so shy and rebelious when it comes to keeping up with the (depressing) news, I probably woudn't have minded getting into government/justice/politics instead of psychology. So in a way, I kind of feel bad that I was actively hoping not to do my civic duties as a juror, but unlike the deed of giving blood, there is too much force involved in this act. 3. If you're paid by your work, you're being paid to sit around and listen! 10. Free Downtown LA parking! 8. Being a juror is NOT easy... someone(s)'s fate is literally in your hands! What do you think about jury duty? Have you ever been a juror? No joke, I've always wanted to be called for jury duty, and I've never been selected! Luck of the draw, I guess, though now that I'm a barred attorney I don't think I'll ever be called. They seem to have a separate list for lawyers. And Brent's been called three or four times since he moved to Philly six years ago! I've never had the opportunity to actually serve on a jury. I think it's very important but I'm not a fan of losing a day's pay to go to court. My wife seems to be called every year--in fact she's has to call in tomorrow evening to see if she needs to go in on Monday morning. You just told Glenn that he was your only blog reader but you already have three comments...I had to check out your blog! I live in SD, very close! This post made my head hurt because I do NOT love jury duty. At all. Thank you for taking my place! Ugg, I hope I never have to go in for jury duty. I think that my company pays us while we are out, but I"m still going to give some funky answers in the interview to hopefully get out of it. Of course, saying that makes me feel sort of scared for who actually gets on those things. I have had to do this before as well, and I think I agree with you. In my county, they make you come down to the courthouse and sit for the whole week in case you are needed, so it pretty much wrecked a week of work for me. I wanted to like doing it, but the whole experience made me feel nauseous. I just didn't like having that kind of pressure put on me. I've been called several times and usually just had to show up for a day and then call in the rest of the days. Last time I postponed it and then called in and was dismissed without even having to take time off from work. Before that, I was on a jury. For 10 days each afternoon, I showed up to the LA County courthouse in Inglewood. There were four defendants charged with misdemeanors (gang injunctions and the like). It was drawn out and kind of boring, but I actually liked it. I'm one of those strange people who does not mind jury duty (and I wasn't paid for it either, but my job is flexible so I can work from home).